At the December Meeting of the Bellaghy Historical Society members were treated to an extremely enjoyable programme of narrative, song and verse recalling the “World of Percy French”. 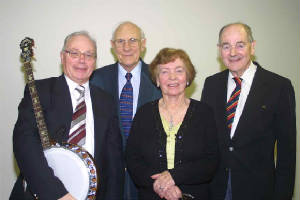 Mr. Bill Moorhead, Mr. Wilfred and Mrs. Isobel Crowe and Mr. Norman Cairns who performed the items are members of the Percy French Society which will shortly celebrate the twenty-fifth anniversary of its foundation. Their enthusiasm, skill and obvious enjoyment in performing the works of this most talented Irishman gave added pleasure to the audience. The famous and well known songs such as “Phil the Fluter’s Ball”, “Slattery’s Mounted Foot”, “Are you right there Michael?”, “McBreen’s Heifer” were some of those sung most tunefully by the men while Mrs Crowe had her audience alternatively laughing and weeping with her talented rendition of “Queen Victoria’s Advice to her Lord Lieutenant”, “Ach, I Dunno”, “If I were a Lady” and other poems. Mr. Norman Cairns played the banjo (Percy French’s favourite instrument) with great skill and the entire programme was interspersed with a narration of Percy French’s life as a Civil Engineer in Ireland and the later periods he spent performing in London, America and Ireland. The narrators recalled also his personal life, the tragedy of his young wife’s death in childbirth, his subsequent re-marriage and his lifelong interest in painting, one of his works having sold last year for 30,000 euro. The evening was one of great enjoyment and gave members a marvellous insight into life in the nineteeth and early twentieth century. Mrs Mary Breslin, Chairperson, thanked the artists, who had come a long way, for a memorable evening’s entertainment. She also reminded members that the January meeting on 8th would be addressed by Mrs Beryl Knox who would recount the History of Springhill, the National Trust property at Moneymore. The Speaker at the November meeting of the Bellaghy Historical Society was Mr. John Stuart, retired Principal of St Louis’ Grammar School Ballymena and current Chairman of the Board of Governors. 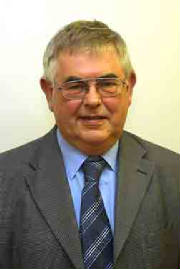 His subject was a “The Railways of Co.Antrim – an Historical Perspective”. He explained that he had been fascinated by railways since he was a young boy and in following this interest he had collected a great number of slides of photographs of Railway Stations and trains now mostly sadly defunct. These illustrated the very impressive architecture of some of the old Great Northern Railway stations with their intricate ironwrought arches where the letters G N R had been skillfully incorporated. Lisburn Station was one of the most impressive and the first line to be constructed in Northern Ireland in 1839. Its line to Belfast and the coastal line from Ballymena to Londonderry were two of the few that had never been discontinued. Many of the old station Waiting Rooms and Railway Houses had been rased to the ground. The last train to pass along the Castledawson -Toomebridge line was a Goods Train in 1959 the passenger service having ceased to operate some years earlier. The coastal train from Portrush to Bushmills still continued to run as a Tourist attraction. Mr. Stuart explained that the width of the railway lines in Northern Ireland varied from those in England and Scotland and recounted the stages by which the sleepers had progressed from timber to the present steel. In referring to the railways of Co.Derry he urged members to investigate and research what evidence there is of the old local railways lines before it disappears or is forgotten. Mrs Mary Breslin, Chairperson, thanked Mr. Stuart for his talk commending his infectious enthusiasm for the subject which made it all the more interesting. She reminded members that the December meeting would be especially entertaining, the subject being”The World of Percy French” when Mr.Bill Moorhead and two colleagues would illustrate with music and verse the wonderful wit and pathos of the writer’s famous songs and poems.